We are living in an age of unprecedented industry change, as industries as diverse as retail, media and manufacturing are undergoing rapid, and often unpredictable, transformation. This accelerating rate of industry disruption is driving companies to adapt far more quickly to the changing business environment in order to survive. Organisations in virtually every industry are having to adapt to these unprecedented rates of change, driven by disruptive forces from digitalisation to globalisation to servitisation, and the entry of new, disruptive competitors into their industries. 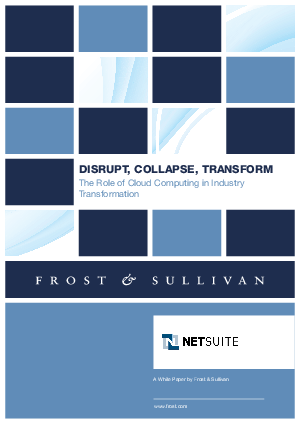 To understand the degree to which organisations are experiencing industry change globally and how they are responding, Frost & Sullivan surveyed 1,500 senior executives (CEOs, CFOs, CIOs and other senior managers) in seven countries (Australia, Hong Kong, Japan, Philippines, Singapore, the UK and the US). Respondents spanned all major industry sectors, ranging from manufacturing to retail. This research shows that most executives not only agree that their industry is rapidly undergoing transformation, but that flexibility and adaptability are increasingly becoming key factors for survival.